Hand cleaning car in Prague with steam – body, rims and door jambs wash. Each vehicle should be washed on a regular basis not only on grounds of appearance. Dirt sediments hold water and can cause corrosion. Naturally it is necessary to wash the car more often during periods of greater dirt charge, above all during bad weather conditions. Specific chapter are snow days with subzero temperatures whent the car body and paint of your car are exposed to the agressive road salt, gravel and other road maintenance materials. Sometimes the tme presuure is to high and you decide to go to an automated car wash. However a couple of times during the year your car should be thoroughly washed and cleaned by hand. Hot steam washing is the most efficient. Steam car wash removes all types of dirt and stains, it is gentle to the paint and last but not least also environment-friendly. Together with the car body we steam wash also the rims and door jambs. Steam hand car wash removes even the deepest dirt and dust in hard to reach places that stay dirty after automated car wash. Car paint and rims regain their original shine. Steam even removes dry insects or the infamous rapeseed pollen. Steam car cleaning and washing produces minimum waste and has sanitation effects. It dissloves dirt and removes them with high pressure. Naturally automated car wash leaves the door jambs dirty. That surely does not look good and is not practical. Your car should be space where you feel good and comfortable and you suerly dont want to make your clothes dirty when getting in and out of the car. Each vehicle deserves high quality cleaning with no compromises at least twice a year. Indulge your car in regular thorough proffesional cleaning. 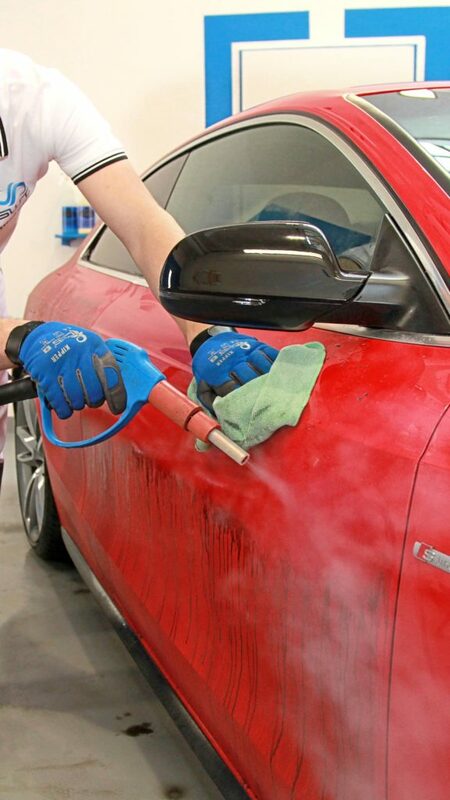 Hand steam cleanig and washing of the body, rims and door jambs is efficient, eco and car-friendly and together with the experience, carefulness and anttention to detail of our team guarantees a perfectly clean exterior.